This new, updated edition of a highly popular guide demonstrates exactly what to do and how to do it to cash in on the tremendous profit-making potential of real estate today. As this valuable guide explains, no other investment within the reach of the average investor offers such a combination of outstanding benefits. Real Estate investors regularly gain not only spendable income, but equity income, appreciation, and tax shelter as well. Written by a well-known authority in commercial real estate, Real Estate Investment and How to Make Them shows step-by-step why you should invest in real estate; how to find the right properties; how to get the best financing; how to successfully handle each step in buying the property; how to manage properties without headaches; and how to gain the most when selling the property. 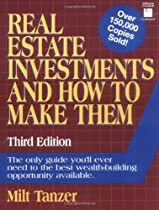 Ideal for beginners in the field, Real Estate Investment and How to Make Them is written in plain everyday English and packed with checklists, charts, and examples. Yet it’s equally valuable for experienced investors – offering a wealth of practical new ideas, techniques, and sound advice to make an existing investment program even more profitable.